Are Their Holes in Your Aura? Hi, loves! Thank you SO much for dropping by on our fourth and final post in our chakra talk series. We’re so excited to be getting into all this with you. I hope you feel inspired to dig in and see where you may need some deep energy work within your own chakra system. Over the past two weeks we covered the lower triangle, heart center and the upper triangle. We have arrived at the last chakra, the aura. Depending on where you read + research about chakras, this one may be included or it may not be. For us, though, it is extremely important. The aura is the electromagnetic energy field that surrounds the body which includes the arc line, the radiant body, and the subtle body. Once you’ve worked through your entire energy levels throughout your being, you want to make sure your aura is strong and protected. Balancing your chakras is key to living that high vibe life full of abundance, bliss and energy. You deserve it. It is your birthright to go after a life filled with happiness. Start small. Work your way up from root to crown, focusing on and balancing each chakra in order to bring in complete harmony. Once that deep and hard work is done, your aura will be strong and you’ll be able to easily tap into your life’s purpose and manifest it. You'll be bright, radiant and magnetic, be able to uplift those around you, and attract opportunities that align with your highest purpose! So, where do you start? We’ve developed our 8-week online course, RISE UP to help lead you on this path of complete vibrational balance. We take you through each chakra with guided kundalini practices, mantras, food guides and meditations that target each energy level in your chakra system in order to achieve and maintain total balance. 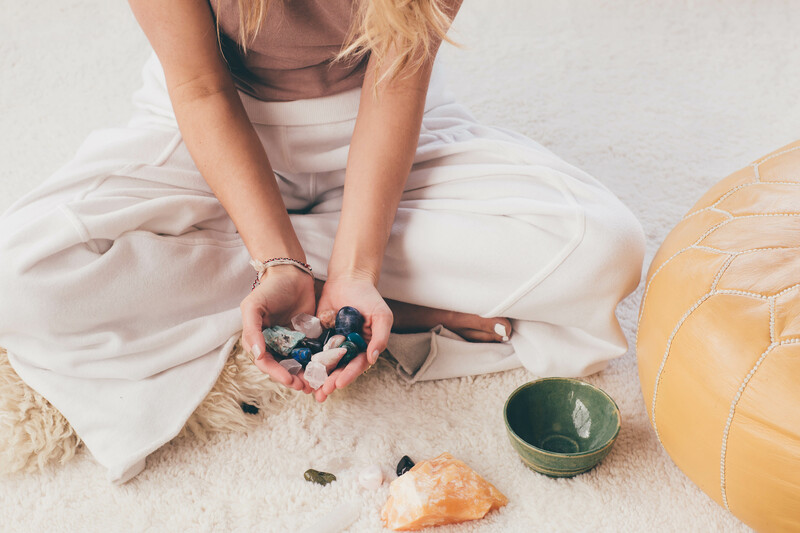 Using tools like essential oils, crystals, and affirmations are simple ways you can begin the work in harnessing your energy and opening up your chakras to bring in all that bliss and positive vibrations. The aura is all about that delicious radiance you emit out into the world. It rests in your electromagnetic field, the energy shield that exists around your entire physical body. The aura is the acclimation of the positive + balanced effects from of ALL the chakras. When this chakra is strong it gathers and collects from all of the chakras for an overall balanced being. It attracts things into your life and repels things out of your life. It protects and rejects for a completely blissful life. It acts as a shield around you full of vibrant, glowing energy. Because of its ability to amplify everything going on in your system it, if you're vibrating lower in some or all chakras, it can produce a shadowy, more negative energy and your aura can then produce holes or tears. So how do you know your aura is damaged? Here’s how you can tell! Our lifestyles can determine the strength of our auras. Self-destructive behavior and unhealthy daily habits can have damaging effects to your aura and can then show up physically, emotionally and mentally. Strong emotions: A clear sign you have a hole in your aura is a constant strong recurring emotion like anger or fear. You may also struggle with intense shyness and anxiety. A hole is indicated by holding yourself stuck in that emotion and inclined to sink into a depression. You also may experience a strong lack of motivation. Psychological trauma: When you experience a trauma either as a kid or in your adult life and don’t go through the work to heal it your aura will produce a hole or tear. Overuse of substances: Depending on drugs, alcohol and other toxic substances can produce serious holes in your aura. Addiction and dependency on mind-altering stimulants and depressants will have serious consequences to your energy field. Physical problems: When you experience a sudden energy loss, headache or migraine, nausea or a sudden illness (i.e. an infection), or a repeated injury in the same location you most likely have a tear in your aura. Sensitivity to others: It’s great to be able to intuitively tell when someone is upset or stressed so you can help them out. However a torn aura may be indicated by an intense sensitivity to others’ imbalances and attracting their negative emotions. You’re not strongly protected and are constantly overwhelmed by the negative energies of others around you. It’s powerful to see how much our emotions can affect our life and how important it is to keep a strong, balanced aura. With a strong aura you’re able to protect your truth and you’re not afraid to speak it out into the world. All of the balanced qualities of all the other chakras are connected and working together. If you’re aura is strong and healthy that means all your other chakras are balanced and open. This a game changer for manifestation. How does it work? When aligned, we’re able to pull in our dreams + inspiration from the ethers into our flow and tune in, then receive it and live it out throughout the entire rest of our chakra system. Creation can flow from the Source down into our strong aura and open crown chakra. If that isn’t some potent energy right there then we don’t know what is. It’s so exciting! Being able to tap into this and really get into your flow, creates a experience that allows you to align with your true life’s purpose. This is your drive. Your job is to maintain balance and keep your being ready and able to receive. Installing balancing practices in your day-to-day, thankfully, works very effectively and very quickly. You just need to be able to show up to it and present the determination to open yourself. 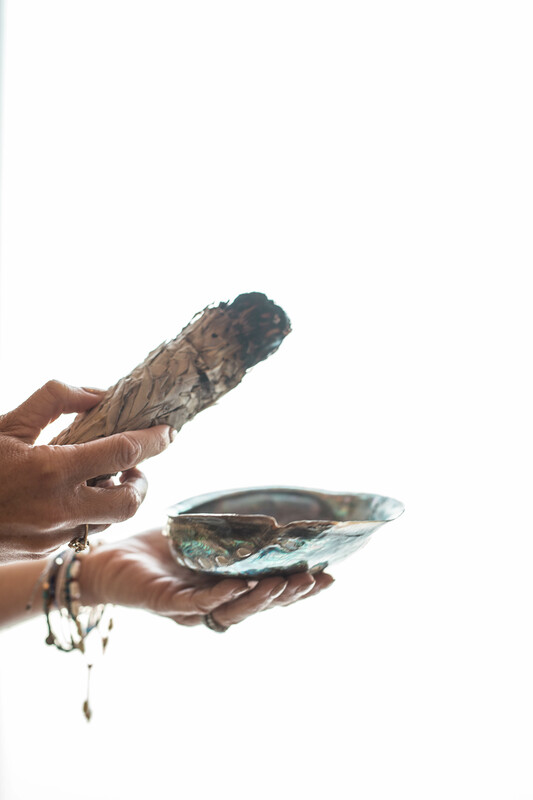 Create a magic balancing ritual: We practice a magic morning ritual every day. Whether it’s a quick tune in, meditation and breathwork or a full hour kundalini practice. Cultivating a daily practice does wonders for your entire being and really helps to strengthen your aura. 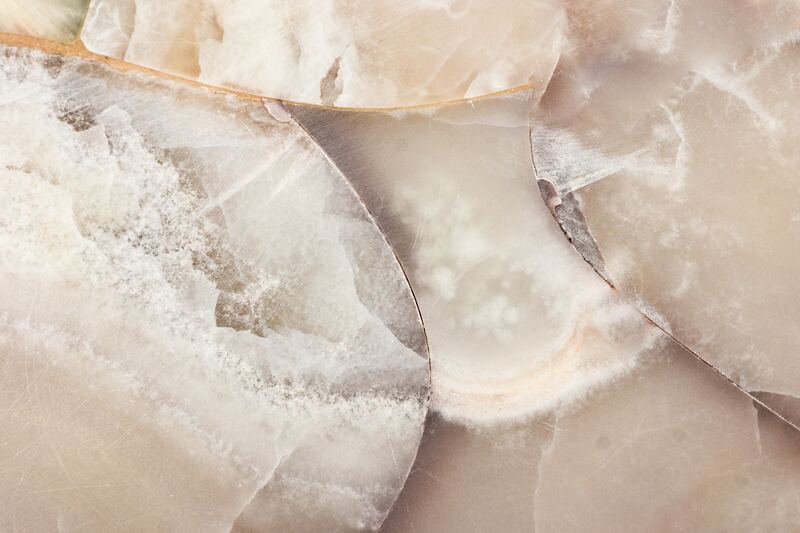 Crystal cleansing: If you need a deep cleanse you can work with a healer and use crystals to cleanse your aura. Or you can use crystals in your meditations to help strengthen your intentions. Practice grounding: This practice is very healing. Simply go outside, barefoot and take in the energy of the Earth. Did you know the Earth has its own chakra system? Crazy, right? Touching feet to the ground with allow yourself to center within and begin the work of balancing and cleansing your energy. Practice meditation: The aura is the culmination of all the other chakras so if they are vibrating harmoniously then our aura is brighter and more radiant. All meditation practices help to balance the aura and we practice Kundalini meditation because it's efficient and works fast at balancing the energy in the body! In RISE UP, we do specific meditations for each chakra to balance them all quickly and we have a full class to strengthen and extend your auric field to make it a bright and powerful attractor and protector. Wearing white clothes: Ever wonder why you see us and so many other Kundalini Yogis wearing white? Or when you practice more meditation that you tend to want to wear lighter and brighter colors? Well, it's said that wearing white clothes will give you an extra 12 inches of aura. Pretty cool right! Your chakras are the energy system in your entire being. Everything is energy. Tapping in and balancing your chakras allows you to tap into your life’s purpose and achieve the career you imagine, the relationships you deserve, and the health and happiness you’re offered. It’s tough to know where to begin, but that’s where we can help! Our RISE UP course guides you through each chakra really taking the time to dig in and balance each one. It works with the flow of your life instead of a two-week retreat up in the mountains, you can do this work in the comfort of your home in your own space. We’ll lead you through mindset work with specific journal prompts, offer you life coaching and guide you through deep wisdom training. You’ll work alongside a strong community with endless love and support as you do the very challenging, but very rewarding work of achieving a high vibrational life. RISE UP is GOING LIVE AGAIN OCT 12th and ENROLLMENT is STILL OPEN UNTIL TOMORROW, OCT. 11th!!! Enrollment is STILL open but closes TOMORROW on Oct 11, 2018. Can’t wait to see you in!! Is your aura strong and protected? Have you been able to reach out and touch your life’s purpose? We’re here to help! Let us know what steps you plan to take to work through repairing your aura. Share with us below or connect with us on Instagram! Most people are never really taught how to breath but it’s never too late and it is so important to learn to breat..
Hi, ETG family! We hope you are all having an elevated holiday season full of love, joy, and warmth. It’s such a magi..